My name is Kathe Kline, and I created MedicareQuick because a new way of dealing with Medicare Insurance, especially San Diego Medicare Insurance, was needed. I was a Financial Planner for 25 years, and during this time I was able to help thousands of clients work toward having a financially sound future. I also was able to learn how to break complicated subjects into easily understood snippets of information. My husband had turned 65 and signed up for a San Diego Medicare Insurance – Supplement Plan with a local agent who had sent him a postcard. My husband, being an Engineer, he had already decided what he wanted– a Medicare Supplement Plan. The agent signed him up for the plan, and then casually asked him if he took any medications. He didn't, and so the agent said goodbye. We wound up getting him a drug plan 5 years later, and now my husband will pay a penalty for the rest of his life. Medicare is complicated! When I first started researching the available options, I was confused! I thought, “Wow! If a seasoned financial planner is confused by this subject, I wonder how my clients are feeling right now.” And that's how Medicare Quick was born. I started working with my own clients to help them with their Medicare Options, and I liked it so much I decided to dedicate more time to helping people in this area. Although it's not as lucrative as financial planning, for sure, I feel like I'm providing a needed service. And, medical bills are a leading cause of bankruptcy, so having the right insurance plan does matter! 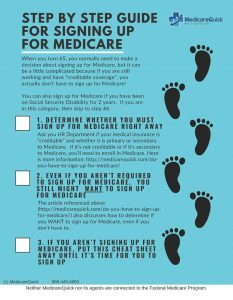 This website is here to give you more information about General Medicare Information , Medicare Advantage Plans , Medicare Supplement Insurance Policies and Prescription Drug Plans (Part D). I really hope you like Medicare Quick, and we hope to see you here often! Don't forget to refer your friends who are turning 65 to this site! *MedicareQuick.com is not affiliated with the United States government, the Social Security Administration, or the Federal Medicare program. *Medical Insurance Licensed in the States of California, Florida, Nevada, and Texas, and Medicare Advantage and PDP service areas vary.